Denver Limo Buses are absolutely, without a doubt, luxurious! spacious! upscale! When it comes to luxury entertainment transportation, don't settle for anything but the absolute best. We have the best vehicles and amenities that are out there and we can service any type of event you may have in mind. You haven't truly lived until you have experienced what our fabulous vehicles have to offer. Call us today. 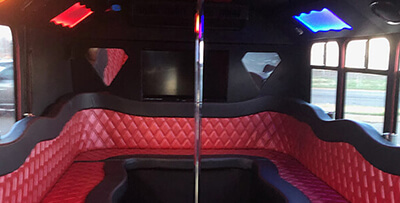 Ride in style and elegance while enjoying music and dancing with a pole and an amazing bar area with built-in coolers. This is the perfect choice for your group. 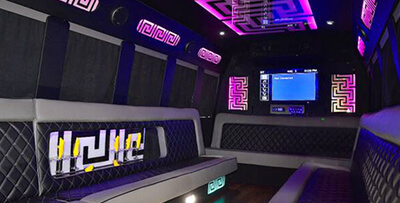 Heads will turn as you and your group roll down the road in this Denver Party Bus vehicle. The amenities are second to none, check it out and be prepared for fun..
Just the words limousine and eyes pop open. This special luxurious limo will astound with its exterior and amazing features. Everything about this vehicle exudes class. Welcome to Denver Party Buses! When you are seeking out luxury transportation for a special event, you want to seek out the best in the business. And we pride ourselves in wearing that moniker. We are confident that we can service anything you have going on. And what we provide is not just bare bones transportation to where you need to go. Our vehicles have been nicknames "a party on wheels" and it will not take you long to realize why. Of course one of the things that you will want to explore is the Rocky Mountains as there are scenic drives setup to help you take in the outstanding beauty. But in addition to this amazing nature, there is truly something for everyone in the area including Unuion Station, the Denver Art Museum, Coors Field, the Denver Museum of Nature and Science and much more. The lightlife is phenomenal as well with many establishments just itching to show you a great time. 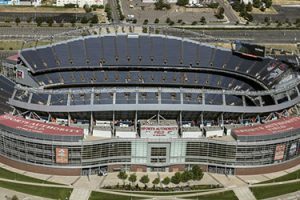 The Denver area offers so much in the way of attractions and that includes things to do inside and in the beautiful landscape that the area affords. But there is one thing that you need to keep in mind as you are planning your activities in the Denver area. Whatever you will be doing, you need a great way to get around and we can offer that and more. Our transportation service is not only dependable, we offer some of the best amenities anywhere along with a guarantee of your complete satisfaction. We can claim dependability because we have certified mechanics on staff who regularly schedule inspections and maintenance of each and every vehicle in our fleet. Our professional detailers will make sure that the vehicle that you step into will look and smell like it is brand new. And our drivers are not only certified, but they know the roads in the area very well. They also always have GPS on them which means you will not have to worry about getting lost. And if you are looking for suggestions in terms of locations to visit, just ask your driver and you will be whisked away to something very special. When you book with us at Denver Limousine, we believe that you should experience the best customer service in every area that we offer. Our knowledgeable and courteous customer service representatives are very well trained in what we do for a living and in how they should treat our customers or potential customers. You will always be spoken to in the most respectful manner and patience is considered a virtue at our company. But we want you to understand something. We promise that you will never be pressured into making any kind of decision. That is not the way that we have chosen to operate. Instead, we are fond of the philosophy that we will treat our customers in the way in which we would want to be treated. And that means being completely upfront with you on everything. There is nothing that we have to hide and we will not try and pull a fast one on you. 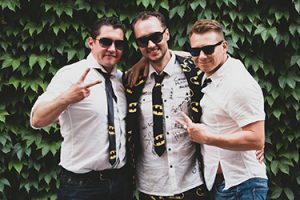 In addition, the entertainment features that we have installed on one of our Denver Party Buses ensures that the party will never stop from the moment that you step inside to the moment that you are dropped off. It all starts with our LED color changing lights which will put you in the mood for a good time in one of our special vehicles. If you are into dancing, we have installed exotic wood flooring and a premium concert quality sound system with subwoofers. Large flat screen televisions with DVD capabilities and built-in bar areas with coolers of ice for your favorite libations and you can see why Party Bus Denver is the best of the best. Check out our website and then call us about any questions you might have, we look forward to serving your transportation needs. Your special day should be serviced by some very special transportation. We can provide that and more. Your special day calls for the best. One of our amazing party buses was made for this kind of event, find out why we can raise the bar for an event like this. A celebration like this doesn't come along every day and you deserve to have the most fun possible on your big day. 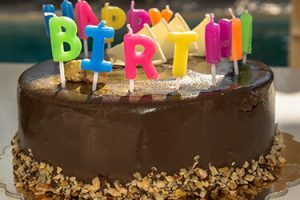 Celebrate your life in a big way! You have never experienced tailgating like this. With one of our phenomenal party buses, the fun will never end. You have never rooted like this. Success! Your quote request has been sent to us. Error! There was an error sending your quote request. Get a quick quote below!